With a mixer, cream margarine and sugar together. Add eggs, one at a time, beating well. Add pumpkin and water, starting on slow speed, and mix until combined. Add the flour, baking soda, salt, baking powder, cinnamon and cloves. Starting on slow speed (otherwise you will be wearing the flour mixture), mix well, increasing the speed as the flour mixture is absorbed. Add nuts and give it a whirl again to mix them in. Grease and flour pans or squirt them with baking spray. 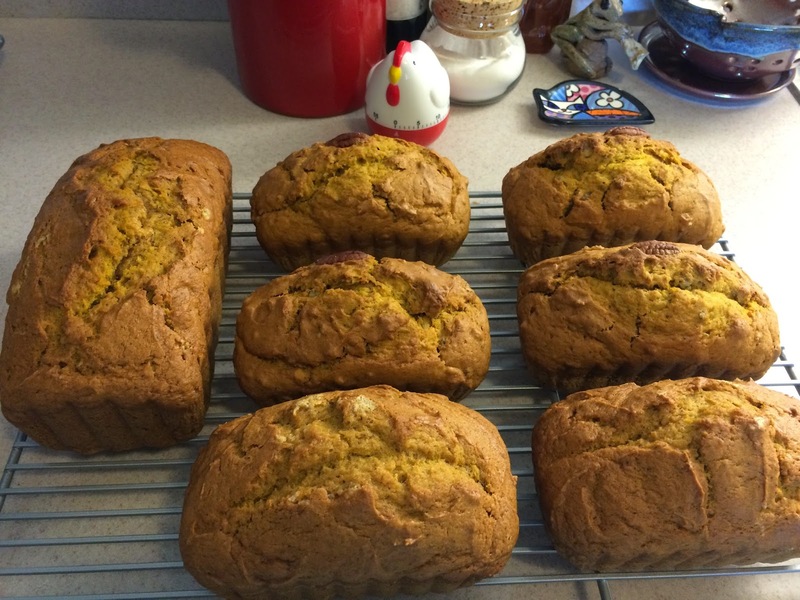 Pour pumpkin mixture into either two regular loaf pans or six mini loaf pans. Fill pans about two-thirds full. Bake in a preheated 350-degree oven for about an hour. Large loaves take a little more time; small loaves take a little less. This bread is not as sweet as cake (I reduced the sugar from 2 1/2 cups), but it’s so much more flavorful than dry, boring zucchini bread, and requires no butter or cream cheese on top. The pumpkin bread freezes wonderfully when wrapped in plastic wrap and topped off in foil. FUN FACT: I found this recipe in Cosmopolitan magazine when I was 16 (!) and have been making it ever since. The original recipe called for chopped maraschino cherries as well, which I thought then (and agree now) is WAY too much trouble. Enjoy! WARNING: Once you hand out mini loaves of this great bread, people start asking for it every November.